This is one of those "wear around the house, but not feel like a slob if you have to leave" outfits that I am essentially always wearing these days. Comfortable, nursing friendly, and not offensive to the eyes. Win-win-win. So, the time change. Boo. Double boo. Losing an hour of sleep when you have a newborn is pretty brutal. Sleep is like a prize these days. I'd rather get some extra zzz's than pretty much anything else (including new clothes!). My son is actually a pretty good sleeper (bless him) but it's still not the same as not having a baby. Sleeping in doesn't really exist anymore, especially when you have a time change situation. Wah. Okay, okay... the whining session over. The goooooood thing about the time change is that spring is a little closer! I know we can all get support that. Bring on the warm weather! I loooove the extra sunlight in the evenings that daylights savings brings. Especially after this winter, which has been so cold and depressing, daylight savings plus our first warmish (50's) week is heaven. It's not too warm for cozy sweaters yet, though. That sweater is on point! Such a cute outfit!! I love that sweater. I could definitely see how the time change would be a bummer with a newborn! I'm all about outfits like this for the weekends. So cute! I'm never a fan of loosing an hour, but I do love the extra sunlight at night. I guess it's a price we pay! I actually was really happy with the time change with Caleb. He had been deciding that 6:30 was a good time to wake up but now it's 7:30 so I'm thrilled. ;-) Yesterday would have been hard, I'm sure, except that it was the first day Nate had been home in a long time so he got up with Caleb and let me sleep in. Good husband award goes to him! Yes to spring and easy outfits that look put together! LOVE that sweater! Aztec prints are my fav! Yay to the extra light in the evenings! The light helps my mood. I am moody in the winter :-) I hear you about the sleep thing. That was the worst. My son will never be a sleeper (he turns 13 this weekend). When he was a baby and my husband and I were both working full time, we would take turns getting up with him on the weekends because he would get up at 5 am! I am currently 8 months pregnant, and wearing yoga pants and a t-shirt. Your outfit is what I would call fancy, in my eyes. :) I feel for you and your lack of sleep woes! I am not there yet, but I will be soon. Hang in there. You look great! I applaud you for getting out of yoga pants! 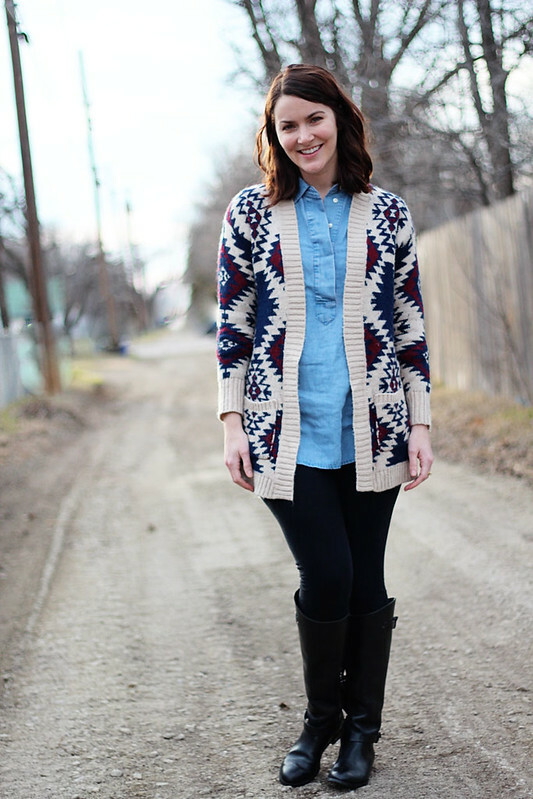 I adore that cardi! I remember the sleep deprivation. It's brutal. I was super emotional and would call my husband bawling begging him to come home early. It didn't help our daughter was not the best sleeper in the beginning (10-12 total hours a day!). Wait till he starts solid food. It will be blissful! Ugh I hate losing that hour, but I'm totally on board with pushing the sunset back another hour. It feels great to come home from work in the daylight! 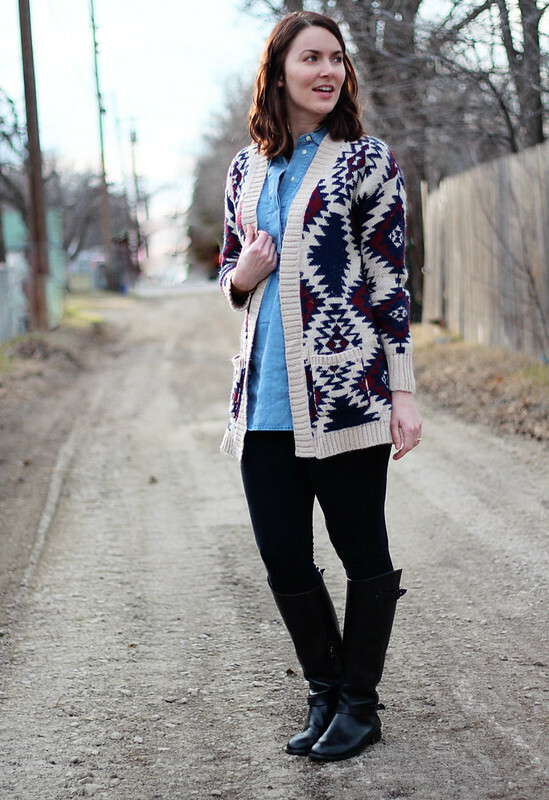 Love this cute and cozy look! Such a cute look! That sweater looks incredibly cozy, and you styled it perfectly. Bring on the warm weather indeed. This is chic and mom-friendly. 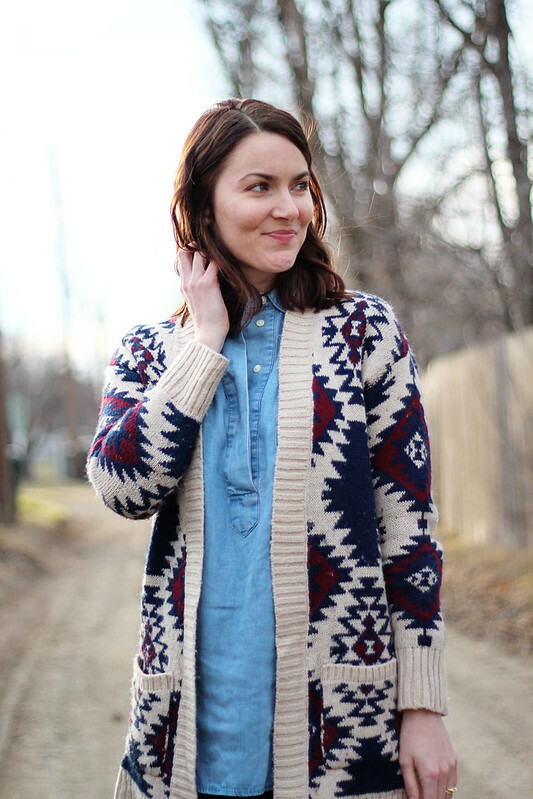 Great Aztec cardigan.